Don’t you feel like every year, the back to school commercials and sales start earlier and earlier? Even though I’m not in school anymore (and I was in school for a long time), it still makes me anxious every year. And I know I’m not alone: Brian has nightmares about it despite the fact that we graduated from college seven(!) years ago. He wakes up in a cold sweat thinking he has a test he didn’t study for. He always says real life is easier than school was. I always loved school so I’m not sure that I agree, but I can say that the back to school recipe roundups and ubiquitous Target ads make me uneasy every year. The issue really is not school, but the waning of summer. I feel like just when summer is finally in full swing and the weather is reliably nice here in Chicago, we’re told it’s time for summer to end and fall to arrive. I for one, am not ready. Summer is still in its prime, and I’m not giving up without a fight. 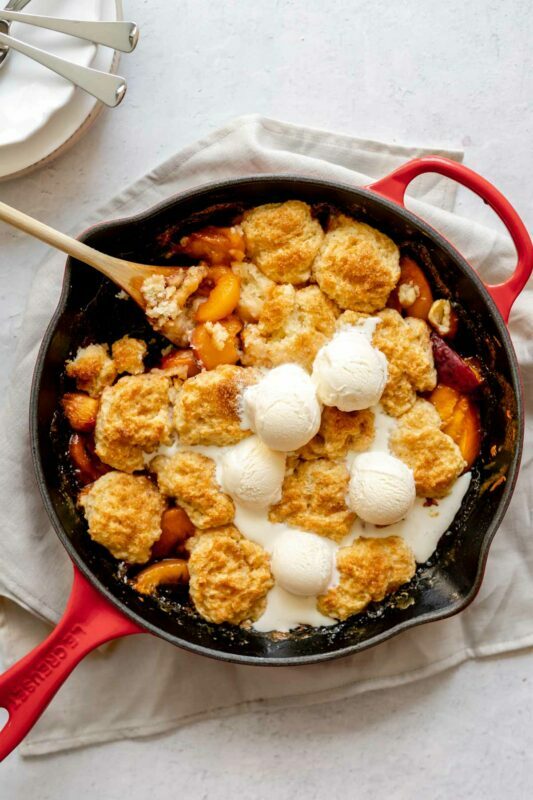 Peach cobbler is the essence of summer for me. My mom made it multiple times every summer growing up, and just the smell of it brings me back to long pool days and walks in the park and dinner out on the porch. This may surprise you, but it’s my number one requested dessert at home and may just be my favorite dessert of all time. 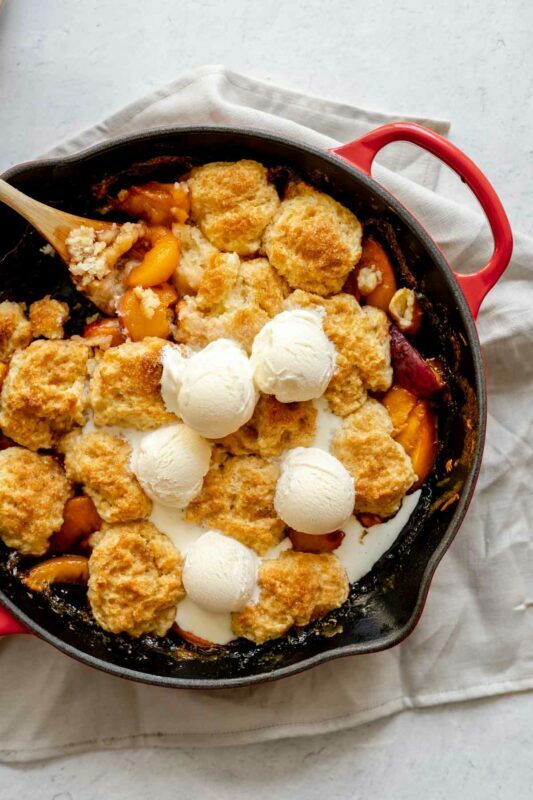 When I was in college, my mom even made and froze the peach base in the late summer so we could have fresh peach cobbler when I came home for fall break. She’s the best mom there is. Since it’s mid-August, I know our summer days are numbered. Therefore, the only way I know to fight the impending end is by ignoring it and making the most summery things I can. In the past few days I’ve made blueberry muffins, heirloom tomato tarts, cherry crisp, peach galettes, tomato corn margherita pizza, and blueberry ice cream. What’s that, you say? I’m overdoing it? I can’t hear you. 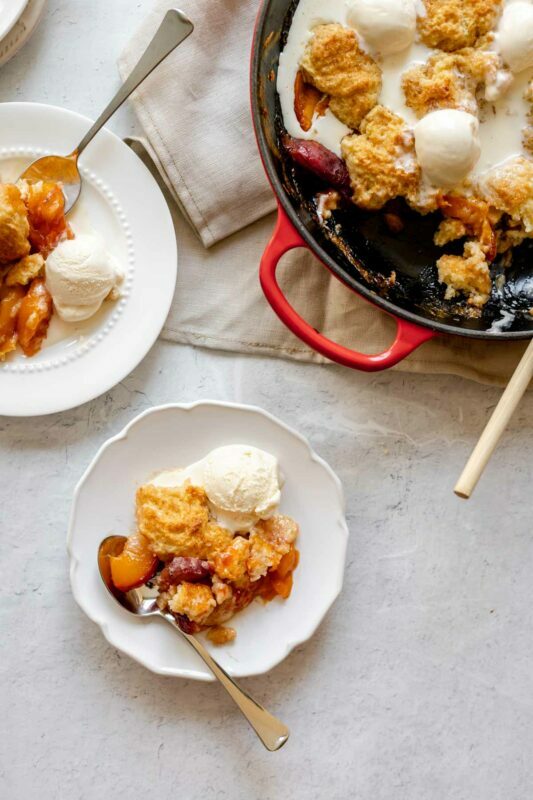 The recipe for this humble, unassuming peach cobbler comes from a dog-eared, well worn Betty Crocker cookbook, one that both my mom and I have (mine is my grandma’s copy). Besides cutting it in half to make it more manageable (read: responsible) for our two person household, I didn’t change it one bit. Some things you just don’t mess with. 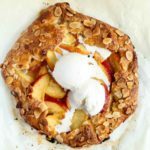 It may seem like an annoying extra step to peel the peaches and cook the filling first, but trust me when I say it’s worth it. 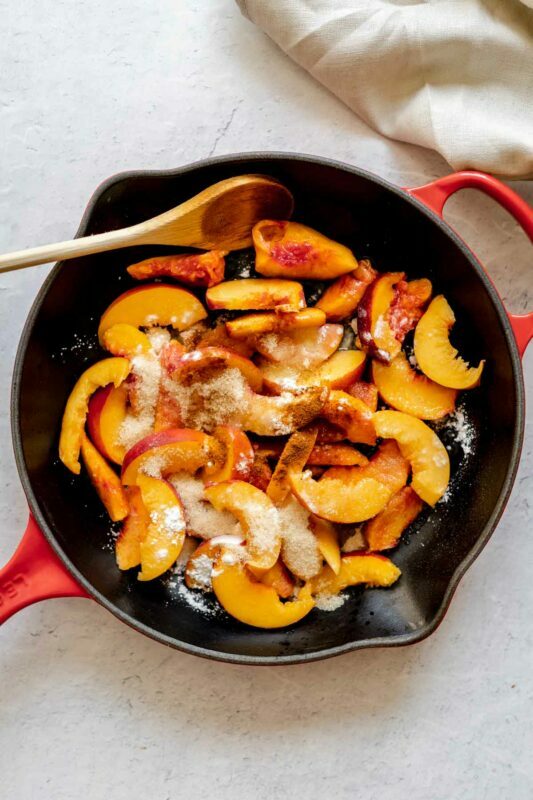 The sugar, lemon juice, cornstarch, and hint of warm cinnamon spice cooks down with the sweet peaches to form the most amazing thick, sticky sauce in almost no time, and it only gets better once you have it in the oven. 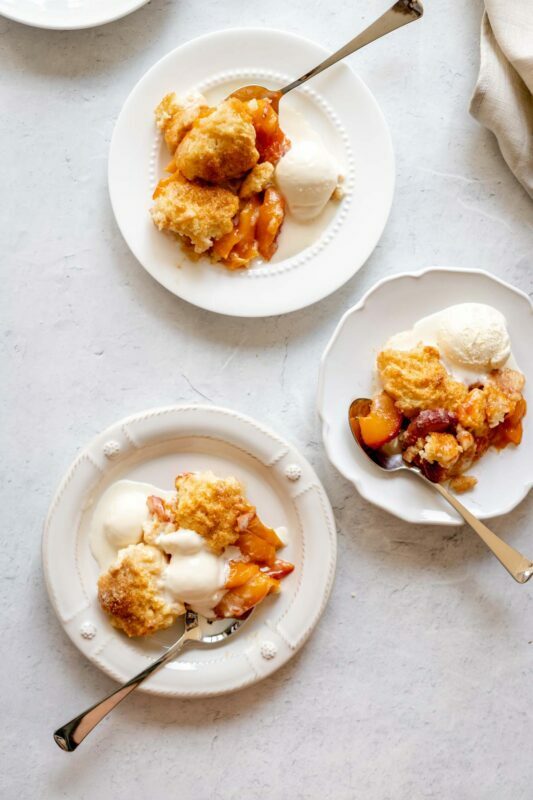 Plus, this is a great recipe to use up any borderline too-ripe peaches you may have sitting around. Maybe you were a little too ambitious at the farmer’s market and bought a huge quart of peaches, only to have them all ripen immediately and leave you scrambling to use them. I wouldn’t speak from experience or anything. 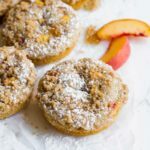 I could probably just eat the peach filling alone every day and be happy with life, but Betty took it to the next level and added the easiest fluffy biscuit topping. Simple ingredients: flour, a tiny bit of sugar, baking powder, salt, butter, milk. Unbelievable results. Baked in the oven, these guys expand and become crunchy on top and super soft on the inside. Don’t know how Betty does it, but I’m not questioning genius. The last requirement, of course, is to add vanilla ice cream on top. I don’t feel like I should have to say it, but in the interest of thoroughness, I will. The ice cream really is not optional here. Sweet cold cream combined with the soft, warm biscuit and cinnamon spiced peaches. Honestly, what on earth is better than this? 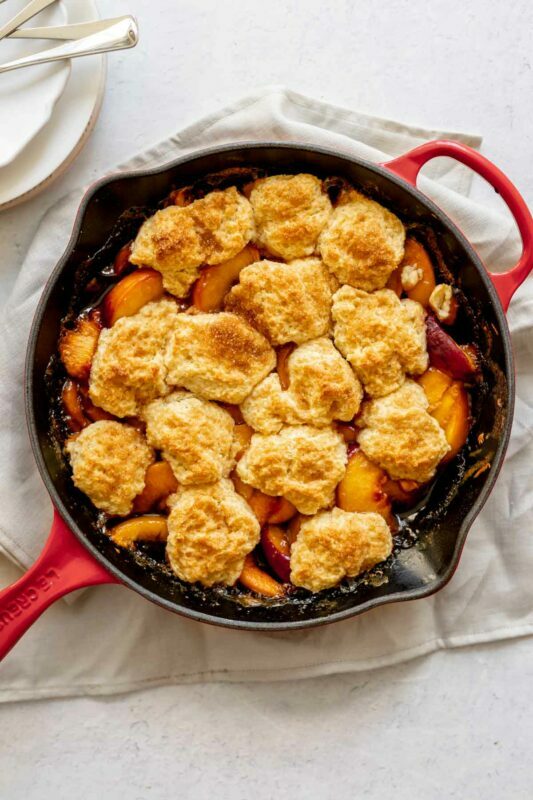 Peach cobbler is the essence of summer: warm spiced fresh peaches with a fluffy, crunchy lidded biscuit topping. Don't forget the ice cream. Preheat the oven to 400 degrees F. Cut each peach in half, twisting to remove the pit. Use a paring knife to peel the peach halves, then cut into slices and place in a medium saucepan. Add sugar, cornstarch, cinnamon, and lemon juice to the saucepan with the peaches and heat over medium heat, stirring frequently, until mixture boils, about 5 minutes. Once it comes to a boil, keep it there and stir for 1 minute until it is thickened. Pour mixture into an ungreased small casserole pan (I used a 1.5 quart Corningware). In a medium bowl, stir together flour, sugar, baking powder, and salt. Cut in the cold butter using a fork, pastry blender, or your fingers (my preferred method), until the mixture resembles fine crumbs. There may be some bigger butter pieces (pea-sized) - that's fine. Stir in the milk until you have a combined dough. Drop dough by even spoonfuls onto the hot peach mixture. Sprinkle remaining 1 tablespoon sugar over the dough. Bake 25-30 minutes, until topping is golden brown and filling is bubbling. 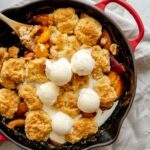 Serve cobbler warm with vanilla ice cream! Cobbler keeps well in the fridge for 4-5 days (though it never lasts that long around here). Reheat individual servings in the microwave. The peach filling can also be cooked in advance, and then frozen once cooled. When ready to bake, defrost overnight in the fridge, then top with biscuit topping and bake, adding 5-10 minutes to the baking time. If you're feeding a crowd, recipe can easily be doubled and baked in a 3 quart (9x13) casserole. Save some for me. I honestly can’t get enough.